2019-03-08 // Venue upgrade in Stockholm, more tickets everywhere! We are really happy to announce that we have now also upgraded the venue in Stockholm and will be doing our biggest club headline show in Sweden ever, as we are now playing on Münchenbryggeriet on the 13th of April. More tickets are out now! Already bought tickets for Kraken are valid as before. 2019-02-08 // Venue upgrade in Gothenburg, more tickets available! We are happy to let you know that due to high demand, we have managed to upgrade venue in Gothenburg from Brewhouse to Trädgårn on the 12th April. Tickets are out now! Already bought tickets for Brewhouse are valid as before. 2019-02-05 // Stockholm SOLD OUT!! Tickets are now also gone for Stockholm, we are so thankful to all of you and can't wait to see you in April for the party of the year Sweden! 2019-02-03 // Contest: Win tickets with Gaffa! It's time to battle! take the chance to win 2 x tickets for you and a friend to any show you prefer in April by entering via the picture on Facebook together with GAFFA Sverige. 2019-01-31 // Gothenburg SOLD OUT!! Tickets are still on sale for Stockholm, but are running low so make sure to get your tickets before it is too late. 2019-01-29 // Tickets are running low! Attention all friends! Tickets are running low and now we have just 100 tickets left for sale in Gothenburg and about 200 tickets left in Stockholm. It's time to act now before it is too late. 2018-12-22 // Vinyl pre-orders available now! 2018-12-19 // Vinyl pre-orders delayed! Due to some technical issues with our webshop as you may have noticed, the pre-orders of AYOD Vinyl have been delayed. We are expecting the webshop to be online and pre-order vinyls to be ready for purchase on Friday 21st of December at 16:00 CET. Thanks for your patience! 2018-12-07 // Hometown heroes Aviana and Awake The Dreamer added! We are happy to announce that the future of Metalcore in Sweden and our High 5ive friends in Aviana and Awake The Dreamer will open the anniversary parties in each of their hometowns in April. (Gothenburg = Aviana, Stockholm = Awake The Dreamer). Get your tickets now! 2018-11-30 // Chemical Vocation joins the lineup for exclusive reunion! We are beyond happy and stoked to let you know that our good friends in Chemical Vocation will be a part of the party next year. CV will be doing two exclusive appearances playing songs from their early years including their 'Selfitled EP' and debut album 'A Misfit In Progress'. 2018-11-23 // Early bird tickets SOLD OUT! Wow!! Stockholm was first and Gothenburg just a few hours behind, but early bird tickets are now officially sold out. However you can still grab a standard ticket here. 2018-11-23 // Early bird tickets out now! Tickets are on sale now. Go to the "Live shows" section in the menu or click the links below to proceed to checkout for the show you wish to go to. Please note that we have released a limited amount of Early Bird tickets for the ones of you that are quick at only 195 SEK, once they are out they are out and the standard ticket price stands at 295 SEK (plus service fee). See you in April Sweden! 2018-11-23 // Normandie added to the lineup! We are very happy to announce that we have added our good friends in Normandie to the party. These boys recently released their new album "White Flag" via Easylife Records. Check it out if you haven't yet, it's amazing! 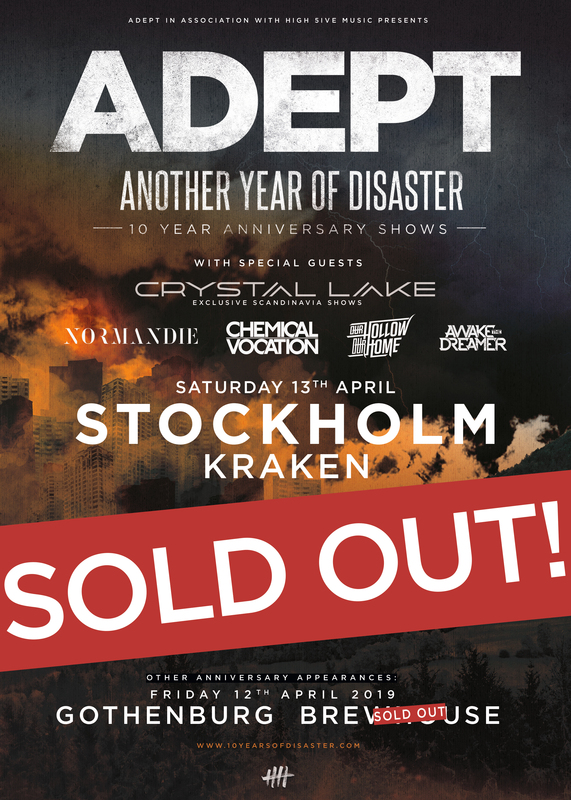 This is the official website of the ADEPT: Another Year Of Disaster - 10 Year Anniversary. Here you can find all necessary information about the remastered Anniversary edition of AYOD that we will release on 1 February, 2019 along with our anniversary shows in Sweden. 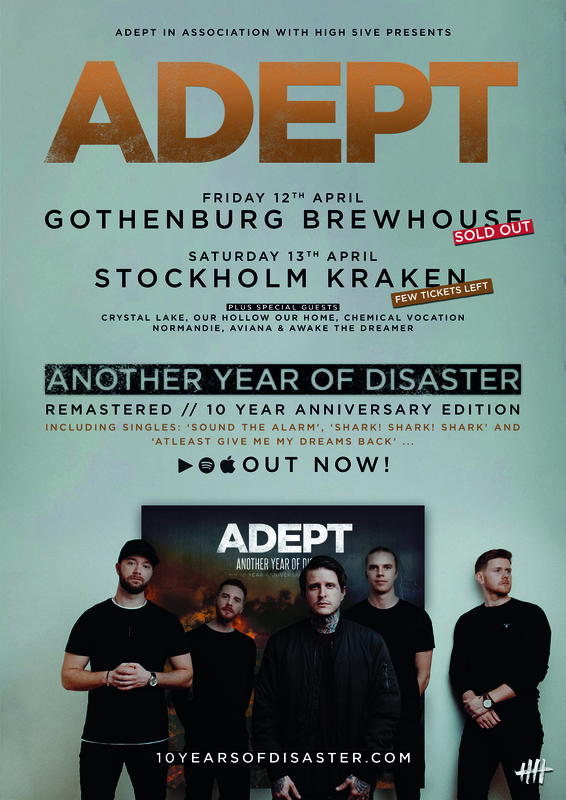 Adept in association with High 5ive Music are proud to present the Another Year Of Disaster 10 Year Anniversary in 2019. 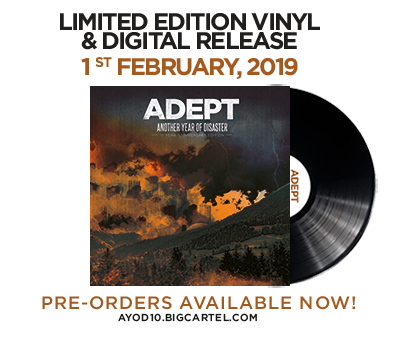 The band recently announced that they will release a remastered issue of 'Another Year Of Disaster' (2009) on the 1 February, 2019 on Vinyl (limited edition) and digitally. 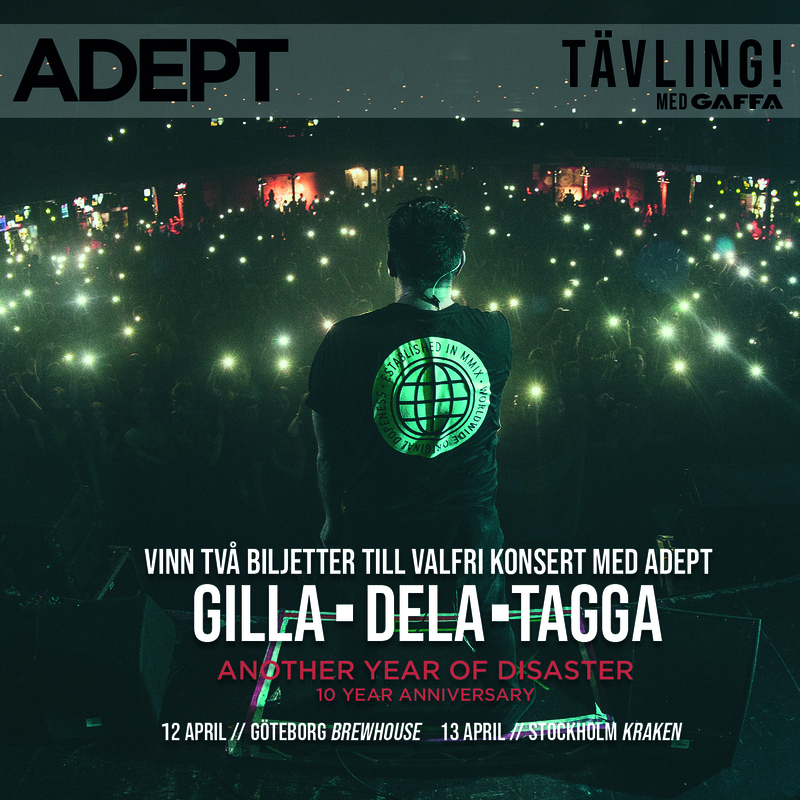 To celebrate this even further the band are hosting their own Anniversary shows in Gothenburg (Brewhouse) on the 12th of April and the day after in Stockholm (Kraken) on the 13th of April. Crystal Lake (JP), Our Hollow Our Home (UK) and you are all invited to party with the band on these dates, let's do this!